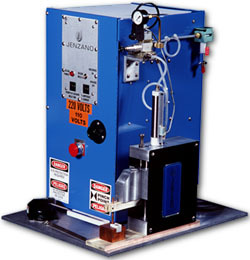 The miniature bench welder is the self-contained assembly solution to serve your light welding applications. The design offers efficiency of space and cost, as well as flexibility and ease of set-up due to the Sub-Plate assembly. Each unit is shipped ready for production welding. Input voltage: 240V +/- 10% - 30 Amp. Dimensions (HWD):	23 ½" x 23" x 18"